It may surprise you to learn that the Christian practice of giving something up for Lent is based on an obscure passage from the popular book, "the Bible." Young people aren’t as religious as they used to be. According to the Pew Research Center, American adults under 40 are 17% less likely to be affiliated with a religion than older Americans. They are also 18% less likely to engage in daily prayer and 12% less likely to attend a weekly religious service. While the practice of giving something up for the 40 days of Lent is still common among Christians, and well-known outside the Christian community, shockingly few young people are familiar with its basis in scripture. Given the deep significance of this Bible story to both religious and secular culture, it is high time that an online comedy magazine reprinted it in full. The following is a synthesis of Matthew 4:1–11, Mark 1:12–13, Luke 4:1–13, and a number of less well-known verses. When Jesus heard this he was greatly distressed, for he was still on season 6 and wished to catch up before the start of Season 8, fearing that one of his apostles (Simon) would spoil something if he did not, so incessant was their Monday-morning GoT chatter. At length, Jesus said, “Thou shalt not tempt the Lord,” or something along those lines, and departed the Temple, feeling lousy. So the devil left him, and Peter was much impressed, though he wondered why Jesus had not told him about his newsletter and worried about it for many days. 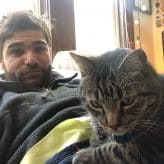 Louis Loftus is a writer, tutor, and proud graduate school applicant living in Boston. His writing has appeared in Fatherly, NYU Local, Medium, TimberWest, and other hilarious publications.